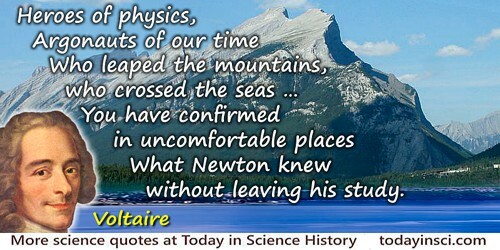 What Newton knew without leaving his study. Discours en Vers sur l’Homme (1734), Quatrieme discours: de la Moderation (1738). English translation as in J. L. Heilbron, Weighing Imponderables and Other Quantitative Science around 1800 (1993), 224. My profession often gets bad press for a variety of sins, both actual and imagined: arrogance, venality, insensitivity to moral issues about the use of knowledge, pandering to sources of funding with insufficient worry about attendant degradation of values. As an advocate for science, I plead ‘mildly guilty now and then’ to all these charges. Scientists are human beings subject to all the foibles and temptations of ordinary life. Some of us are moral rocks; others are reeds. I like to think (though I have no proof) that we are better, on average, than members of many other callings on a variety of issues central to the practice of good science: willingness to alter received opinion in the face of uncomfortable data, dedication to discovering and publicizing our best and most honest account of nature’s factuality, judgment of colleagues on the might of their ideas rather than the power of their positions. The mathematician who pursues his studies without clear views of this matter, must often have the uncomfortable feeling that his paper and pencil surpass him in intelligence. From 'The Economy of Science' in The Science of Mechanics: A Critical and Historical Exposition of its Principles (1893), 489. The student of mathematics often finds it hard to throw off the uncomfortable feeling that his science, in the person of his pencil, surpasses him in intelligence,—an impression which the great Euler confessed he often could not get rid of. This feeling finds a sort of justification when we reflect that the majority of the ideas we deal with were conceived by others, often centuries ago. In a great measure it is really the intelligence of other people that confronts us in science. In Popular Scientific Lectures (1910), 196. The suppression of uncomfortable ideas may be common in religion or in politics, but it is not the path to knowledge; it has no in the endeavor of science. We do not know in advance who will discover fundamental insights. The universe is merely a fleeting idea in God’s mind—a pretty uncomfortable thought, particularly if you’ve just made a down payment on a house. In Getting Even (1971), 33.